An engine that runs too hot does not last long. While your engine’s cooling system is responsible for regulating operating temperature, your exhaust system also plays a major role. Much of the heat energy of the combustion process is unusable and must be disposed of quickly. That is the job of all the piping and ducting that runs from the motor to the back bumper. Hot air and vapors are cleaned, cooled, and passed safely out of the rear pipe. Old worn out pipes with leaks and restrictions need to be replaced. We specialize in muffler repairs and can install custom exhaust systems that will hwlp keep your engine running at its best. Contact our Meineke #2517 in Pleasant Hills, PA, for an evaluation. It's important for drivers to know the signs of a failing aftermarket exhaust system. The easiest way to tell if there's a problem is when your exhaust system starts producing a louder sound. This means there is a leak in your high performance exhaust system. Leaks are usually caused when the flexible weave of the exhaust system starts to rust. This is the most vulnerable part of your exhaust. If you've noticed that your exhaust is louder and you're worried about a leak, contact Meineke #2517 at Pleasant Hills, PA. and we'll diagnose the problem and take care of any muffler repairs you need. A high-performance exhaust system for your car plays an essential role in the proper operation of the vehicle. When your car engine runs, fuel combustion naturally creates harmful gases. The performance exhaust system expels those gases from the car and keeps them from entering the interior. It also controls the emissions and amount of pollution released into the air while quieting engine sounds. It is important to fix a leak in high-performance exhaust systems as soon as it is detected because leaks can affect your car's performance. 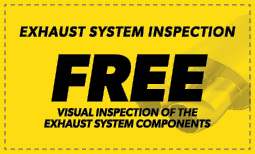 Visit your local in Pleasant Hills, PA, to have your exhaust system checked out. Exhaust systems do eventually wear out. The combustion process inside of your engine creates a tremendous amount of heat. This forces chemical changes to occur. While much of your fuel is burned up, one of the remaining byproducts is water vapor. This vapor comes into contact with the metals causing oxidation and rust. Eventually the metals of your manifold, pipes, and car muffler wear out. They develop cracks and weak spots. You may hear loud engine noises or notice an odor as you drive. Fixing the problem may require an aftermarket exhaust or even a custom exhaust system to be installed. If you are experiencing any of these warning signs, contact our in Pleasant Hills PA, and have your vehicle inspected. 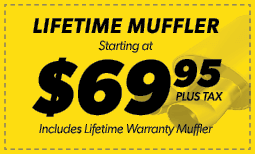 The best muffler shop for your vehicle in Pleasant Hills, PA, is Meineke #2517. Our friendly and professional mechanics are custom exhaust experts. They can get your vehicle back in tip-top shape in very little time. We know that muffler repairs can be an unwanted expense, but you can’t afford to drive your vehicle around with a bad exhaust system in place. Along with equipping your vehicle with a performance exhaust that is tailored exactly to your vehicle’s specifications and use, we offer you the most competitive pricing around. Bring your vehicle in today for one of our quality performance exhaust systems for cars and experience the savings.